Everybody that has a Boxer just loves them to bits. It is one of those dog breeds that just crawls straight into your heart. This is a buyer’s guide to help you find the best dog food for Boxers. Boxers are a medium to high-energy dog breed. Despite the lovable puffy faces, lots of dog owners love their Boxers specifically because they have so much energy and tons of personality. This, however, usually means that Boxers can have some very specific nutritional demands. 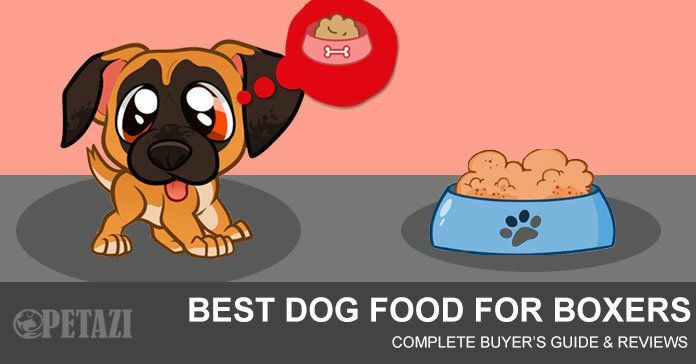 This buyer’s guide is here to help you choose the perfect food for your Boxer, since it can be pretty confusing with all the options available out there. By giving you all the relevant information about what Boxers need to maintain a good shiny short haired coat to a sparkling personality, as well as a detailed account of many different types of food out there, I am sure you will find this guide to contain everything you might need! Boxers are large, muscular, square-headed dogs who can look quite imposing — that is, until you look into their eyes and see the mischief and joy of life reflected there. Because of their playful nature and boundless energy, they are sometimes called the “Peter Pan” of the dog breeds. Like most other medium sized, lean muscle-dogs, Boxers require food that has a high amount of protein, medium amounts of fats, low amounts of carbohydrates, and just the right amounts of vitamins, fatty acids and minerals that will ensure overall health and growth. Here are some things to consider when choosing the right food for your Boxer. Boxers have a daily caloric intake of between 800 and 1600 calories per day. This amount, however, will change depending on exactly how active your dog happens to be. The exact amount of food that a dog needs on a daily basis will also be effected by the dog’s age and whether or not the it is pregnant. Puppies need to eat more regularly than older dogs. A typical Boxer pup needs 55 calories per pound of body weight. Boxers are lean and fairly muscular dogs. They are also known to have a lot of energy. They therefore need a lot of protein in their diet. An average Boxer diet has to contain at least 30% protein, but can contain up to 80%. This however, will depend on whether their tummies can take it. Dogs’ carbohydrate needs are definitely not the same as that of people. A wild canine diet would consist almost entirely of protein and fat. A little bit of carbs can be a good thing, especially if it is vegetable based. But be sure to avoid any food with a lot of added grain. It causes lots of allergies in Boxers. All animals need some vitamins and minerals. Wild animals get them from salts in rivers and from the flesh of other animals that consume them. When it comes to dry dogfood, however, vitamins and minerals have to be added. These additives are responsible for things like keeping your dog’s teeth and bones and eyesight healthy. Dogs, just like people, can be plagued by allergies. A lot of the time allergies are caused by grains and other processed carbohydrates that are added to the food to bulk up the volume at a low price. If your dog is suffering from these allergic reactions on its skin or in its digestion, have it checked out by your vet, and switch to a more natural dogfood as soon as possible. Food that is high in fat is not good for Boxers. Since these dogs can suffer from serious heart disease when they become overweight, it is good to make sure that this does not happen. The other main thing that is harmful to Boxers (and other breeds) is filler carbohydrates like grains. It is really bad for dogs to eat these types of cheap fillers! We all know what our dogs like, and there is nothing you can do to change your dog’s taste or preferences. Just buy flavors that you know for sure your dog is going to love to eat. Puppies need to enjoy their meals just like we do. Imagine you had to eat the same meal every day. At least make sure it’s a good one! Since people generally stick to one, or a few types of dogfood over the lifetime of the dog, it is important that 100% of the nutritional requirements have to be met. Make sure that the food does not have lots of grains and soy, that might cause serious health issues in the long run. Boxers are predisposed to certain health problems. Make sure the food you buy for your Boxer will help with that and not make it worse. If you decide to buy cheaper food for your dog, make sure that it still meets the minimum nutritional requirements for your dog. If the cheaper food only contains a lot of fillers (grains or soy mostly) your dog will have to eat a lot more just to get full. This way it might even work out more expensive for you in the long run. If you decide to buy cheap, fine. Just make sure you buy smart. These are all very important points to consider when buying dogfood. As I mentioned earlier, this is a choice that will affect the health and happiness of your dog for a long time to come. Fat is important for a shiny coat, so if you like the shiny coat make sure the diet contains some fat. The same goes for protein and energy or muscle. All dogs are different and enjoy different tastes, and will prefer different brands. Keep this in mind while you read through our detailed list of top 10 best dog foods for Boxers and decide which will be the one for you. Check how much of the food your dog will need to consume on a daily and monthly basis. Make sure you are familiar with your dog’s daily nutritional requirements. If your dog has any allergies or long standing health issues, please keep these in mind. Your dog’s favorite flavors, and the ones to avoid. Your own personal financial situation. The truth is that this food is actually very good. It can be quite expensive, but it is decent dogfood. We really wanted to include a vegan option on our list for those of you who are more environmentally conscious. Unfortunately, this brand just does not have enough protein to sustain a breed like the Boxer. They need a lot of protein to maintain all that lean muscle and high energy. If your Boxer is getting quite old, or has severe meat allergies, this might be a good choice. While it is still an excellent dog food for Boxers, we had to ultimately make a choice between the Earthborn Great Plains Feast and the Earthborn Coastal Catch. The reason we chose the Great Plains Feast, and left out the Coastal Catch, was basically just the way Boxers seem to respond to the taste. Both options are good, and either might work for your dog, but in our taste tests, the boxers seemed to prefer the Wild Plains flavor. It all comes down to your dog’s preference, but generally speaking, Great Plains is just more popular among Boxer owners. Our editor’s choice for the number one best dog food for Boxers is Taste of the Wild Dry Dogfood. The reason this one came out on top is quite simple. It’s because it meets so much of our criteria of what is important in a good Boxer dogfood. There are more details in the actual review below, but Taste of the Wild basically offers a high protein diet. It is close to what would be a natural canine diet, while still having some added vitamins and minerals to boost your dog’s immune system and general health. It has high protein, medium fat and low carbohydrate contents. In other words: Perfect for Boxers. On top of that, it comes at a very good price. After taking into consideration all of the factors that would make for a very good Boxer dogfood, we compiled a list for you. This is the top ten best dog foods for boxers. Every entry on our list comes with a detailed review where you can read a little bit more about the contents of every brand. The idea is that this will give you more than enough information to settle on the absolute best dogfood for your best friend. Wellness CORE Natural Grain Free Dry Dog Food consists entirely of high quality natural ingredients. It has absolutely no added grains. Most of what you feed your dog from this pack will be nutritional content. This mean that it will take smaller amounts of food for the dog to get full. Turkey and Chicken are the protein sources of this dogfood. As we mentioned earlier, protein is very important for all dogs, but specifically muscular brands like Boxers. The protein helps to maintain the lean muscular build of the Boxers, while still contributing to growth and general health. Another positive thing about the Wellness dogfood brand is that it contains real vegetables which provides your dogs with the highest quality of natural vitamins and minerals to boost their immune systems and maintain their good health. Wellness Core Grain Free dog food contains decent amounts of dietary fiber that helps to promote the dog’s digestive health. At the same time, it does not contain any artificial or potentially harmful additives. It’s all natural ingredient, which is a big advantage for this brand. Overcall, Wellness Core Natural is a highly balanced dogfood that is very high in protein dog food that is. It is very well suited for lean muscular, high energy dogs like Boxers. All this while containing absolutely no fillers and limiting all ingredients to those coming from natural sources. The flavor is appealing to most dogs. The ingredients are all gentle on the health issues of Boxers while still catering to their high energy, high protein dietary needs. Boxers sometimes have heart problems; this brand has lower than usual fat. Does not contain grain or other carbohydrate fillers. Added vitamins and minerals help maintain Boxers’ immune systems. Popular flavor, even for fussy eaters. Pro biotic properties are harsh on some dogs’ tummies. Best to test it out first. If not stored properly, the food might release an unpleasant smell. There have been some cases reported of dogs developing allergic reactions. Some dogs really love the taste of fish. If your dog is one of those, this is your brand. It contains Salmon, and the dogs seem to be crazy for it! The salmon flavor is surprisingly popular, which is really good news if you have trouble getting your dog to eat healthy dry food. Salmon contains all of the protein rich properties of other meats, while being lower in fat and containing very healthy omega 3 and omega 6 oils. These oils are very good for maintaining a healthy coat. They will really make your puppy shine! Good fats, like the omega oils are a key ingredient to healthy-looking pelts, while not putting their hearts at risk. The fish based protein, is also much gentler on your dog’s system. If you want to give your puppy something that is more gentle without compromising on the protein content, this is the brand for you. It contains probiotic properties and natural vegetables that will help even further to make this food very easy to digest. The salmon based protein of this food really sets it apart. This is also a standout positive for Boxers, since lots of Boxers struggle with heart problems. Salmon is the best way to get the fat without putting the heart at any risk. In fact, the oils and fats from the salmon are actually good for the heart. On top of all of that, the brand is also one of the most easily digestible brands. Ideal for dogs that are growing into adulthood. Kind and gentle on the systems of dogs struggling with allergies. High Protein content that suits Boxers requirements. Fish oils and fats are good for heart problems that Boxers are prone to suffer from. Fish fats help maintain a shiny coat. This food might lead to severe gas problems, if your dog is not used to it yet. You, as the owner, might not like the smell of the food. Keep it in a closed container. This brand can be quite expensive. Wellness Complete has a very good reputation amongst dog owners. They have been around for quite some time and have been providing high quality dogfood for many years. Generally speaking, when a brand builds a good reputation, it is for a good reason. Wellness Complete sells themselves to customers as a natural dry food with premium ingredients. This is true. When you have a closer look at their ingredient list, you will see the full range of natural extracts, vitamins and minerals that are in the food. It also contains real chicken, so the protein is easily digestible. The added vegetable sources help to support the immune systems of growing and ageing dogs. Like most of the foods on our list, this is a grain free product. It has a very popular flavor, and the effects of the high quality ingredients are immediately noticeable on malnourished dogs. It might be a bit costlier than some other options, but the quality makes up for the cost. This is a well-rounded food with protein, fat, carbs and lots of added vitamins and minerals. Overall, this is an excellent food choice for your Boxer or any other lean muscular breed. Wellness Complete is also a very good option for older dogs due to its good balance of ingredients. Well-known, popular brand with longstanding reputation of quality assurance. Not the highest protein content if you are specifically looking for muscle gain. The flavor can be a bit bland. But this really depends on your dog’s taste. Taste of the Wild was our first pick and our editor’s choice. This was not a mistake. We chose it as our nr.1 pick for very good reason. The brand philosophy is to make dogfood that is as close as possible to a natural canine diet in the wild. All of the ingredients in this food are natural. That means that, so all the protein, fat and minerals come from various forms of all natural sources. The fact that the ingredients are so natural, also means that the food is much easier to digest than highly processed brands. The venison and lean Bison flavors are naturally meaty, and incredibly popular with thousands of dog owners. The flavor comes through very strongly, and most dogs can’t get enough of it. It is important for Boxers to follow the right diet, with enough protein to help them grow into their lean muscular bodies. Meeting all of the needs of such a muscular, but still high energy dog can be difficult and super expensive. Taste of the Wild is an option of doing all of this without having to bankrupt yourself. The brand is popular amongst lean muscular dog owners because it is a relatively affordable way of meeting the exact dietary needs of this particular kind of dog. High protein, healthy amounts of fat and enough vitamins and minerals to keep the general growth and health of your dog up. Our nr.1 pick! Good and very popular flavor. High protein content that suit Boxer needs. Certain dogs might take some time before learning to like and digest this food. Especially if their systems are used to lower quality foods. This is a special type of dogfood. This is specifically for owners who want to feed their dogs maximum amounts of protein with the specific goal of building muscle. Orijen Adult is almost as good as going to the butcher and feeding your Boxer fresh, raw meat. This is a type of dogfood that is incredibly high in protein. If you are interested in giving your dog the maximum protein intake, this is the food for you. If you are training your dog for sports or competitions (dog shows) this might also be a brand that you should consider. All of the protein sources in this food are ethically sourced by the company themselves. Free range chickens, fish, and meat. All packed freshly into this super high protein food that will see your dog, develop grow and maintain high levels of energy throughout. When we say that this food is high in protein, we are not kidding. The percentage of protein in this food is actually a whopping 80%. This is very high and might be hard for some dogs to digest, but if your dog can handle it, and your budget can take it, this is a very good option to consider. We have to mention that this is the most expensive food on our list today. It is not available to everybody. The price, however is justified by the high quality of the ingredients. This is simply one of the absolute best high end, ultra-high protein dry dogfood out there. If you can afford it, you should definitely buy it! Mirrors a raw meat wild dog diet. The best high protein dogfood available. Very expensive, even compared to other quality brands. Buying the food for the first time is risky. If the dog dislikes the flavor, you would have wasted a lot of money. Ultra-high protein diets are not good for dogs that are not very active and not getting the appropriate amount of exercise. We wanted to include at least one entry on our list that would cater specifically to puppies. Boxer puppies also have specific needs. Similar to adult Boxers, but slightly different. When your dog is still growing into adulthood, it is very important that it meets all of its nutritional needs so that it can grow into a healthy, happy adult Boxer! Blue Wilderness Grain Free Puppy Food contains all of the most essential ingredients that a growing Boxer might need. Blue Wilderness Grain Free Puppy Food contains DHA — which is a fatty acid that is specifically found in their mother’s milk. The chicken and turkey protein sources are gentle enough for puppies to digest while providing them with all the necessary protein requirements to grow into healthy adults. This food is not made or marketed as specifically for Boxers. But since it has a higher than average protein content, it is an excellent choice for puppies of a lean medium sized muscular breed like Boxers. The high protein and medium fat content is perfect for Boxer needs. This is without a doubt one of the best available options for Boxer puppies. It will provide your puppy with a solid healthy foundation as it grows into an adult Boxer. Specifically designed to be gentle of puppy tummies. Contains lots of protein for growth and muscle development. Added vitamins and minerals help with healthy bone growth. The company provides good support of clients having trouble with puppies not eating the food. There have been reported cases of puppies developing a dependency on this food and having trouble transitioning to adult brands. Some puppies get sick from the food. Smell of the food can be quite strong from the bag. This brand is made exclusively with an array of wild meats. It is a very high quality source of protein for your dog. This high level of protein encourages the development lean muscle mass in your dog, and is especially good for Boxers and other muscular breeds. With a good fat percentage at around 25% per serving, it is good for very active Boxers, but might be bad for animals that are prone to heart problems. The L-Carnitine ingredient assists with the conversion of body fat into muscle and daily energy. Egg protein is also a major ingredient that can help to bring up the protein level of the food in a more natural way. Earthborn Holistic Great Plains is a good, and highly balanced diet for a dog breed like Boxers who need a high protein diet. It can however be bad for your dog’s heart if it is not a very active dog. I would recommend this brand to anyone who has a dog that is still pretty young and full of youthful energy, or a dog with a very active lifestyle and might use the extra fat. Higher than normal fat percentage that is particularly good for dogs with active lifestyles. High fat can be detrimental for dogs that do not have active lifestyles. Fat is only good of your dog needs the extra fat for energy, if not, it might lead to heart disease. Fruits and vegetables in the recipe might lead some dogs to have uncomfortable issues with gas. Of all the entries on our list, this is the only dogfood that gets its protein content form deboned duck. Definitely a unique ingredient when it comes to dogfood. Duck is not a cheap ingredient, so it might be helpful to think of this food as a type of gourmet dogfood. Similar to the Orijen food, this is Ultra-high protein content with a whopping 70% protein. The other 30% is also impressive: it contains no unnatural fillers. It is totally made up of fresh produce packed with healthy vitamins and minerals. This combination of ultra-high protein and natural products gives you a very impressive dogfood indeed. It will provide your Boxer with all of the muscle fuel and healthy nutrients it could possibly need. Merrick dogfood is also enriched with Omega 3 and 6 Oils. which is good for your dog’s coat and heart. Fat can be dangerous for the hearts of boxers, but these fats are actually helpful. Added Omega 3 and 6 oils for beautiful coat without risking heart problems. Protein source is duck, which is a unique flavor. Some dogs find it hard to transition to this food, especially if they are used to something else. Reports of struggles with gas, especially in the early stages of using this food. Some dogs do not like the flavor. Especially if you try to introduce it later in the dog’s life. This, as you will see, is actually quite similar to our editor’s pick. The only real difference is that this particular brand is specifically for puppies. So it has some extra things that cater specifically to growing dogs. With the focus on young dogs, the protein content is a little bit lower and the calcium and mineral content is slightly higher. The calcium and mineral ingredients are there to help with the healthy formation of bones and joints as the puppies grow into adult dogs. Like our other entries, this brand does not contain grain. This means that there are no fillers that just bloat the puppies. All the ingredients have nutritional value and will assist in the dog’s growth. All of the added fruits and vegetables deliver natural antioxidants to help support a healthy lifestyle and general health. Everything that is good about Taste of the Wild Ed’s choice, is also included in this version of the food. The only difference is that this version is tweaked specifically for pups and made with their healthy growth in mind. Added minerals specifically to stimulate growth and development of puppies. Some puppies have some difficulty to move on to the adult brand after getting used to this one. Causes gas in puppies that just come off nursing from their mothers. This entry was added to our list in order to cater for dogs that either due to old age, or illness are less active than usual. Wellness Simple Natural is very similar to the other Wellness products, but it is extra sensitive to the systems of dogs that have trouble with some other, stronger foods. The brand basically tries cater for older, or sick dogs. With age or ill health, comes certain dietary requirements. So despite the fact that it still contains all the things we have come to expect in good dog food for Boxers, it is simply easier for their systems to digest. High Protein, medium fat, low carb and high vitamin and mineral levels without any intense flavors or ingredients that might cause digestive issues of any kind. Specifically created to be sensitive to older or sickly dogs. All the flavors and ingredients are basic and mild so they won’t upset any sensitive or sickly stomachs. It does still contain all the protein the dog might need to maintain its lean muscular body. Sensitive on the digestion of any dog. Might be a bit bland for dogs that are used to stronger flavors. Does not contain enough calories for younger, healthy dogs. The pellets are small and can be messy to clean up. Our dogs are a part of our families! We love them and want the best for them. If you have read this far, you are also clearly interested in giving your dog the best in nutrition, but also find something that they like to eat. Boxers have plenty of love and even more energy to give off. To maintain their personality and energy, they need a diet with plenty of protein, decent amounts of healthy fat and minimal amounts of carbohydrates. It is important to watch out for obesity and heart disease in any breed of dogs. Boxers are no exception, especially when it comes to issues with their hearts. They are very prone to heart disease. Problems with obesity are often also linked to other health issues —mainly cardiovascular disease. Boxers are very susceptible to heart conditions such as aortic stenosis and the so-called “Boxer cardiomyopathy”. Obesity is also bad for hip dysplasia, which is also a common problem for Boxers. Watching your dog’s weight is thus a quick and easy way of making sure it is not at immediate risk of heart disease. The following list of criteria is what guided our food choices to ensure that your dog has a shiny coat, healthy weight and a big smile. Protein all the way! Boxers have a ton of energy and muscle! Protein is the very foundation of energy and muscle. Our list therefore focusses on food that has plenty of protein while avoiding fillers like grain and soya that lead to allergies. It is very important that our dogs should love their mealtimes. We specifically included a wide range of protein rich flavors so that you can find something that your puppy will be very happy to eat. Fish, chicken, wild meats and even duck! Anything to get your puppy excited for mealtime. Boxers are known to have sensitive stomachs and tend to develop allergic reactions to corn, soya, and other fillers. These products have little nutritional qualities and are just used to add weight to the food. So we focused on food with low carb, or filler content so that everything in the bag is geared to making your puppy happy and healthy. Of course we all have to consider our budgets. Our goal was to include options for all types of people. We have cheaper options available on our list, but they are still excellent brands that will not do your dag any harm. Every dog deserves a happy, healthy meal without you having to go into debt for it! We focused out attention on dry food, mostly because of convenience. When you come home from work, or have to leave in a hurry in the morning, you want to be able to give your furry friend a good meal without having to spend long times preparing it. Only the best dry foods with all the nutrition and none of the hassle. Just open the bag, measure the amount, and put in the bowl – easy enough right? In terms of storage space and convenience, dry food is totally the way to go. Simply seal the bag, or transfer it into a plastic container and you can store it basically anywhere without having to deal with unpleasant smells. Never mind the chore of opening and storing wet dogfood from cans. When it comes to food, dry food is much easier than wet food to clean up. No need for soaking and washing the sticky mess out of your dog’s bowls. No more scrubbing with a sponge and detergent of hours! Just rinse the bowl under the tap after a meal and you are ready to serve your puppy’s next meal. Apart from the convenience, dry dog food is almost always much healthier for your dog than canned or other wet foods. Dry food contains much less fat and unhealthy calories than canned foods that are often packed with preservatives and fatty calories. Considering Boxers’ heart issues, it is very important not to take any chances in this regard! The foods on our list all have clear nutritional information on the pack as well as feeding instructions by age and breed! They are easy to follow and will guarantee that you give your puppy just the right amounts of just the best food. We really hope that this list and our reviews help you to make an informed choice when it comes to your Boxer dogfood. It’s your best friend and deserves the best food! The market is so full of brands and choices; it can be hard to know if you are buying the right thing. We hope that this helped you to get some clarity on the matter. Boxers are a special breed of dog. Everyone who has one knows it. All us Boxer owners are always willing to go to extra lengths to get the best for our dogs. Did you enjoy our list? Did we leave out your favorite Boxer food? If you find this helpful, share it with all your friends who also have Boxers! Next articleWhy Does My Cat Sleep On Me?